You are here: Home / Development / Title Block #2: Let’s Make a Multi-field SmartShape! To refresh your memory, let’s have a quick look at how the multi-field shape works. 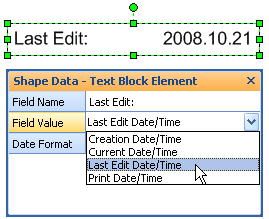 A single shape has a field name and a field value that is date/time-related. The field name is shown in the left text, the value on the right. The user can enter any text for the Field Name, select from a list of four different date/time related info items. Field Name is what you want to call the data, and this shows up on the left-hand side of the shape. “Last Edit” is shown in our example above. Field Value is the data that you want to display, in this case, we’ve chosen to show Last Edit Date/Time. These four blocks all stem from the same shape! So let’s get to work putting one of these shapes together. The first thing you need to do is simply draw a rectangle, on a blank page in a new Visio document. We’re going to rough-out three fields using this dialog box, then polish them off in the ShapeSheet later on. Using the dialog shown above, add three fields. To do this, just set the Label, Type and Format fields to the values show in the table below, then click New. After Field #3, click OK instead of New. The “A;B;C” bits are placeholders for the choices that we will offer in the drop-down lists. We’ll specify these more fully using the ShapeSheet in just a bit. So let’s jump into the ShapeSheet and add some smartness to this shape. To view the ShapeSheet, just go to Window > Show ShapeSheet. You’ll see a rather spreadsheet-like interface that can seem a bit frightening at first, but we’ll only be changing a few of the cells, and ignoring the rest, so don’t worry! 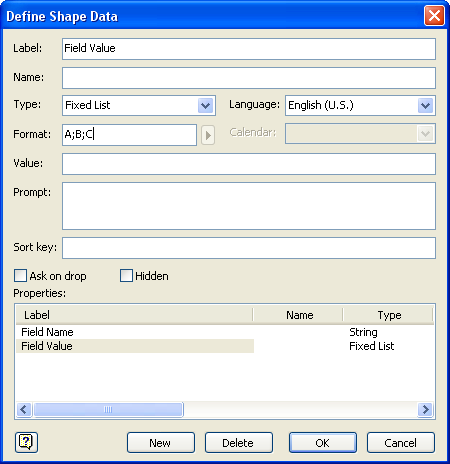 The Shape Data fields that we created earlier using the Define Shape Data dialog are also accessible in the ShapeSheet. In fact, we could have defined all three of the fields in the ShapeSheet, but I thought you’d appreciate the friendliness of the dialog. You should be able to scroll down in the ShapeSheet and find the Shape Data section. If you don’t see it, be sure to go to View > Sections, and check Shape Data. Now we need to replace the A;B;Cs in our Format cells with something that makes a bit more sense. For the field values, we’ll give nice English names to the date/time info that we will be offering. For the Date formats, we’ll offer a selection of valid “formatting pictures”. I won’t go into exactly how these work, but you might have seen something similar if you’ve ever messed with Excel’s Format function. Note: you do need the quote marks, but you might get the fancy 66 99 quotes when you copy, which could cause an error. If this happens, just manually enter normal quotation marks at the beginning and end of the lists. Back in the Shape Data window, you should now see that the A;B;C lists have been replaced with something that looks a bit more like the shape we introduced at the beginning of this article. Before we link our Shape Data to the text in the shape, we need to perform some intermediate calculations. The end-user doesn’t need to see this, so we can add what are called “User-defined cells” to hold our scratch formulas. While still in the ShapeSheet, just go to the View > Insert Section, and choose User-defined cells. You should see the User section magically appear, with one row: User.Row_1. We’ll need two user-cells, so right click in one of the cells, and choose Insert Row from the context menu. You’ll want to make sure that you’re viewing the cell-formulas, not the cell-values. You can switch between formulas and values via the View menu, or by right-clicking in any ShapeSheet cell. What do the User-cells Do? So now that you’ve blindly copied my cryptic formulas into your user-defined cells, let’s talk a bit about what they do. User.index essentially turns our choice of fields into a number that we can use in other formulas. If, for example, we choose “A” from the list of “A;B;C”, then User.index = 0. If we choose “C”, then User.index = 2. It’s a zero-based lookup. Since User.index refers to Prop.fieldValue and Prop.fieldValue.Format, it will tell us which item we have chosen from the Field Value drop-down list, in number form. Now that we’ve set up our data and ShapeSheet formulas pretty well, it’s time to show off our work in the shape’s text. The first thing we want to do is link the Field Name to the text on the right of the shape. This is a straight-forward process. The field name will now be shown as text on your shape. If you don’t see anything, make sure you’ve typed some text into the Field Value Shape Data field first! Your shape is just about ready to use! There’s one last thing we need to do in the ShapeSheet to get everything working properly. You may have noticed that we haven’t used our date/time formatting for anything yet. There’s a nice drop-down list in the Shape Data window, full of odd-looking date/time formatting options, like “M/d/YYY”, but they don’t do anything! So let’s hook-up the formatting of the Field Value to our date/time stuff. We can do this in the Text Fields ShapeSheet section, which you’ll find if you scroll way down towards the bottom of the ShapeSheet. There, you’ll notice in the Value column, two old, familar cells: Prop.fieldName and User.fieldValue. You’ll also notice that just to the left of the Value column is the Format column. 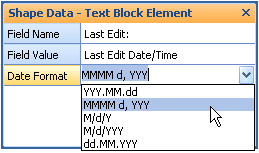 As you might guess, this column can control the formatting of the value in the Value column. Since the first row holds the Field Name, which is just text, we don’t need to do any special treatment. But the second row holds our date/time value, which we certainly want to format…according to the choice that the user made for the Date/Time format! You can enter the formula by typing “=Prop.dateFormat” into the cell (no quotes), or you can type “=”, then scroll up and click on the actual Prop.dateFormat cell, then hit Enter. Just like you would in Excel. As we discussed in the previous Text Block article, this shape works better if the Field Name is left-aligned, and the Field Value is right-aligned. You can do this by setting text alignment for the whole shape, and then fiddling with the text-ruler to configure the tab that exists between the two text elements. So the first thing to do is select the shape and click the left-align button on the Formatting toolbar. You’ve seen this button in Word and Excel and many other apps as well. Then, you need to enter text-edit mode, by pressing F2 or double-clicking the shape. If you don’t see the Text Ruler, make sure it is visible by right-clicking (while still in text-edit mode) and checking Text Ruler. Now, position your cursor just before the second field, and click the little “L” icon on the top-left of the text toolbar, until you get a right-aligned tab icon–sort of a reversed “L”. Now, click somewhere near the right-end of the ruler. Your Field Value will magically jump to the right-side of the shape. If you stretch the shape, you’ll need to re-enter text-edit mode and pull the tab stop further to the right. This can be slightly annoying, but there’s no built-in, easy feature that keeps two text elements on opposite sides of a shape. But not to worry, we’ll discuss how to solve this in a future article. Now that you know how to link a series of labels to a series of ShapeSheet functions, you’ll naturally want to extend this shape to include more built-in functions. Add another item on the end of the list stored in Prop.fieldName.Format. Be sure to include a semi-colon before the new entry. Since this article’s example deals with date/time-related functions, it’s best to add only new date/time-related options to this shape, otherwise the formatting might give bad results. As a bad example to illustrate several points, we could add the shape’s area to this shape. A shape’s area could be calculated with the formula: Width*Height. Not a huge amount of work. But the problem here is that we will be applying date/time formatting to a decimal value if the user selects Area. Not a good idea if you ask me, but an interesting lesson to ponder at the very least. While it is nice to be able to independently specify the Field Name from the Field Value, we could save even more time if we just linked the two together. That’s all there is to it! The user can still type in a custom Field Name, but by default, they’ll have the automated field name and only have to choose a value and a date/time formatting string. Well I’m glad to see you made it this far. That was a lot of nitty gritty, today. But I hope it was worth it for you, and you’ve gotten a much better understanding of how Visio works, and what makes SmartShapes tick. If you’re still having trouble getting the multi-field shape to work, you can sneak a peek at some working versions we’ve provided for you. Previous Post: « A Re-programmable Visio Multi-shape: The Configurable Stickman! It would be really nice to have a printer friendly version — not just this article, but all of the others too. I find it works well if you select just the article–without the side bars–then choose “Selection” in the print dialog. If you have a print to pdf “printer” installed, that gives you another chance to check the output before wasting any paper. I hope you can guide me in the right direction – I’ve been banging my head against this for a while! I have a Sharepoint List connected to Visio where the user can define project milestones. Data is connected to Visio and works, but Visio milestones by default will work only with START date. I don’t want to use the INTERVAL shape, but I’d like to be able to drag the same milestone date onto a timeline twice – aligning the first copy using START date, and the second copy using FINISH date. Alternately, is there a way to use the Interval shape to do this? 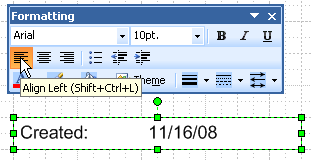 The only graphic elements I really want are a circle or triangle on START and END, with the date showing above. Not the filled in interval or outline, because my timelines get too cluttered that way. I tried this approach first but could not figure out how to use just line ends vs. having the entire interval outlined/filled in. When you insert a field into a shape, the Insert > Field dialog allows you to specify some formatting. Once the field is inserted, you’ll see some rows in the Text Fields section of the ShapeSheet. Two of the columns in this section are Format and Value. I just referenced the Format for my date to one of the Shape Data fields: Prop.dateFormat, instead of hard coding it from the list of formats. So the inserted field is now more dynamic in that the format can be changed by editing the Shape Data field (“M/d/Y HH:mm:ss”, etc.) — even by users through the UI. There is also a ShapeSheet function called FORMAT that allows you to format values in various ways. This function is very similar to Excel’s. Wow… I haven’t had a chance to work this tutorial yet but this site is a godsend. Thanks. hey – will this work with standard Visio? 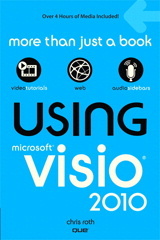 I just discovered that there’s a Professional Visio as well – and I think that was the one I wanted…. nevermind – i got it to work – i just dont have as many options as your screen shots show – thanks! Vis Guy, great articles and information… much appreciated. my question is concerning the title block example that you refer to. Is it possible to have multiple text fields that are linked to the Smart Shape data, instead of having just the one and then trying to figure out tabs and formatting and such? If you have multiple text blocks, then you need to use a group of shapes. Usually you have your variables, parameters, data fields at the top level (the group) so your subshapes have to refer to the cells in the group, which is a bit trickier. Prop.FontSize = 15 pt (be sure to specify points or you’ll get a 15-inch font! Where Sheet.5 is the id of the group, and will likely be different in number. See: What’s My Shape’s ID for more info about shape ids. Unfortunately, adding the printer version costs me time that I don’t have, and doesn’t bring in any revenue. The ads on the web pages help support me and this site. This article shows several shapes having “inserted fields” for text, so yes, you can have multiple shapes with fields. All you have to do is group the separate shapes together to make a single shape.